The two main factors that developed my love for wine were my Grandfather and a bottle of Rustenberg John X Merriman. My Grandfather taught all things great about farming and it was a bottle of John X Merriman that sparked this fascination that I now have for wine. 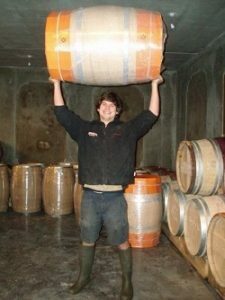 I trained at the University of Stellenbosch, but I learned a lot about making wine by travelling and working to gain experience in a whole to of different wine regions. I have been fortunate to have gained some experience from working in areas like Barossa Valley, Napa, St Emilion, Tokaj, Sancerre and Pomerol. Other than my harvest experiences overseas I started working at Klein Constantia in 2008. At this time I was working under my mentor Adam Mason who was then head winemaker at Klein Constantia. Adam showed me what winemaking was all about and guided me on this amazing journey. In 2011 Adam decided to move to Mulderbosch in Stellenbosch and to my fortune I was appointed as winemaker at Klein Constantia. This was only for a trial period and I had to prove myself with my first harvest in 2012. My first harvest at Klein Constantia must have been quite good as I have been here ever since. My aim is to make a truly Klein Constantia style wine and the only way to do this is to respect the terroir and by thinking out of the box. At Klein Constantia we have some of the greatest terroir in the world thus as a winemaker I try as hard as possible not to manipulate anything when it comes to making our wines. Muscat de Frontignan, we use the Muscat de Frontignan to make our famous wine the Vin de Constance. It is incredibly humbling to be part of only a select few winemakers that have made this wine in the last 300 years and it is up to me to make sure that the amazing standard of this wine is upheld and preserved at Klein Constantia. It is also just fun to make. I harvest up to 25 different batches from 3 vineyards, each batch has a specific idea behind it and they all form part of this complex wine. Harvest takes 3 months, fermentation takes anything between 6 months and a year and then it is aged in barrel for up to 5 years. Other than this the main reason is that there is no other wine in the world made in this technique and it is completely unique to Klein Constantia. I think that the wine industry has had quite a tough few years but we are getting to the point that the producers that are putting in the extra effort are starting to stand out and eventually the challenges will balance out. Tough question, I really don’t know. All that I can say is that I hope that the wine industry doesn’t become over commercialized everyone needs to have their own identity and uniqueness. That’s what makes wine so fun.